1. 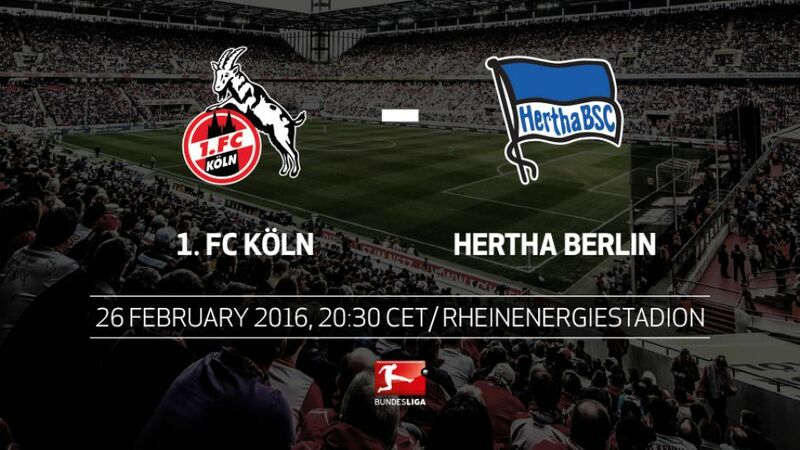 FC Köln and Hertha Berlin get the Matchday 23 action underway when they meet on Friday night with the faltering visitors seeking a first maximum haul of 2016 (kick-off 20:30CET/19:30GMT). Hertha remain in the third and final automatic UEFA Champions League place, though the Old Lady has struggled recently, and travel to the RheinEnergieStadion without a win since the turn of the year. The form of Salomon Kalou, who grabbed the equaliser against VfL Wolfsburg last Saturday, is cause for optimism, but usual attacking partner in crime Sami Allagui remains sidelined. Köln are six places and seven points worse off than the visitors in ninth, with last week's 1-0 loss at Borussia Mönchengladbach leaving the Billy Goats five points off the European places. Marcel Hartel, 20, could feature after impressing from the bench last Saturday. "He is a slight and tricky player," said coach Peter Stöger. "Marcel brings speed to the game. He has done really well." Köln have already celebrated as many home wins this season (4) as they did in the whole of the 2014/15 campaign.Hertha are still yet to win in the second half of this season (D4, L1), and would be in the bottom three if only games played in 2016 were taken into account.Nevertheless, Berlin have more points on the board (36) than they managed in the whole of last season (35).Hertha won on five of their previous six visits to Cologne (four times in the Bundesliga, once in Bundesliga 2).Ibisevic's brace in the reverse fixture ended a 20-month drought and were his first goals for Hertha. He is yet to score in 2016.Köln have not kept a clean sheet since the 0-0 draw with Darmstadt in Week 14. Conceding for eight consecutive games is already an unwanted record for coach Peter Stöger.No Bundesliga player has scored as many away goals this season as Kalou, who has struck eight times on the road.Hertha have the third-best conversion rate in the league (an average of one goal for every seven shots). Köln have the third-worst record (a goal for every 12 shots).